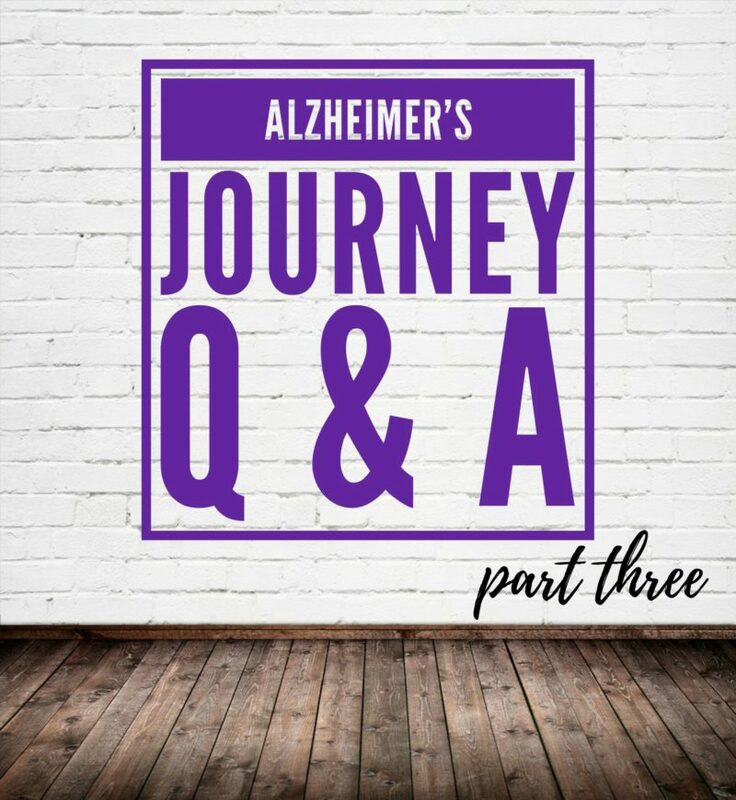 It’s been about five months since our last Q & A so I wanted to open up the discussion about Alzheimer’s again. Five months can mean really big changes in the progression of this disease. I’ve created a separate Instagram account called Love and Open Arms to share about mom and received the following questions. *Please keep in mind I am not an expert nor do I have a medical background. This is simply me sharing our experiences in order to help support others. How old is your mom? How long has she had this? 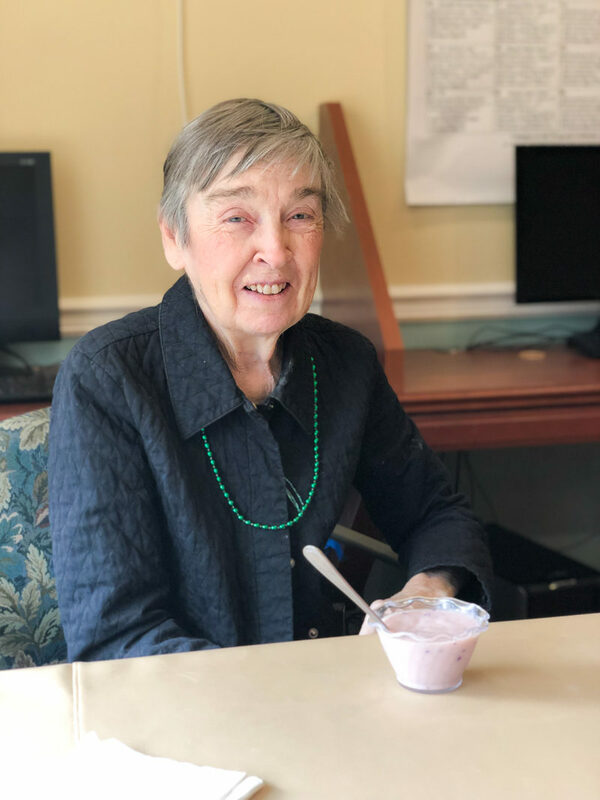 Mom is now 76 years old and she has been living with Alzheimer’s for 10 years. How is your mom doing? Does she recognize you still? Mom’s disease has progressed a great deal in the last year. She does not know that we are her daughters, but she is happy to see us and knows that she trusts us. There are also bad days when she does not recognize us as familiar. On those days, we often try and then walk away and greet her again. It’s staggering, but even just a few minutes can make a difference and she may recognize our faces. Mom has very few words now and does not make sense when she speaks. She is easily agitated. Having said that, she is fairly easy to redirect and distract. She no longer has any interest in seeing photos on our phones and does not engage in any type of meaningful conversation nor does she show interest when we talk about the children or other things she once knew. What calms your mom when she gets really agitated? Million dollar question and if we had a concrete answer her life and the lives of the caregivers would be so much smoother. Often times if she is exit seeking or very upset, just letting her push on the doors, get frustrated and walk away is the best thing. Imagine yourself being mad or frustrated and having no way to express yourself. Do always know what makes you irritable? Not always, right? So these emotions are real but there is no way to tap into them or talk through them. She loves music and she loves love. So smiles, hugs and redirecting to something happy is often what we do. My mom doesn’t answer the phone and doesn’t want to. Is this a normal stage? She still has high cognitive functioning. While I am not an expert, from what I have experienced this is quite normal. My mom went through this. In my heart I believe that she knew she was struggling and that can cause signs of depression as well as embarrassment. My mom developed wonderful coping mechanisms but phone calls were always very difficult. What I did not know is that dad would write cue cards for her with names and key pieces of information to have next to her when she was on the phone. I can’t imagine that feeling. I would likely stop talking on the phone, too. How did you know it was time to move mom into a community? I think my mom is ready. We felt mom and dad needed support long before she received it. My amazing dad cared for her every day of his life in their home. It was an enormous amount of responsibility and the stress took it’s toll on his health. When he suddenly passed away, my sister and I were in a position of having to find a new home for mom. My dad was with her 24 hours a day and could not take his eyes off of her. It wouldn’t be safe to leave her alone and has a tendency to wander. It was a traumatic time in our lives. Because of mom’s progression, she never really understood that dad was gone. 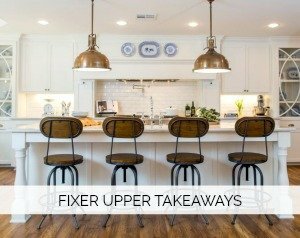 Was it hard for your mom to adjust to her new home? Yes. It’s a huge transition. 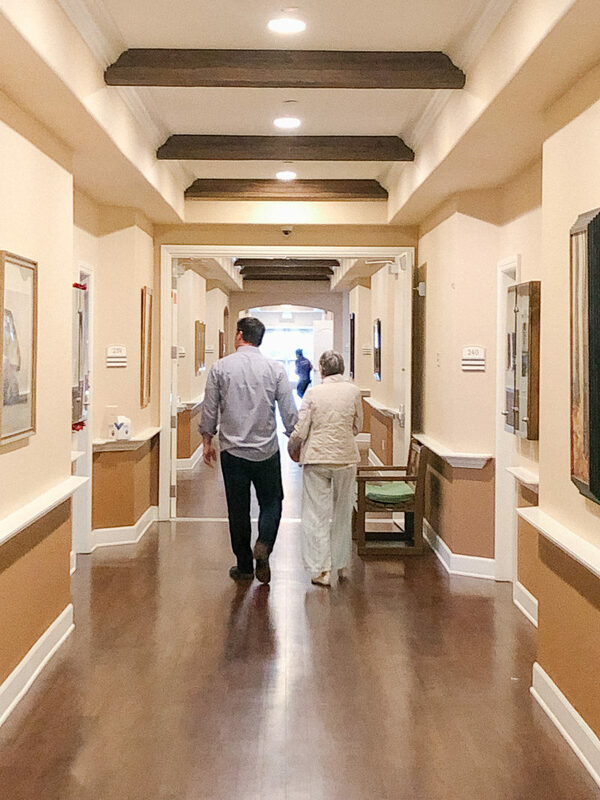 The care community expects that and is prepared for that. I did not visit for two weeks as I was so afraid she would want to go home with me. Having said that I was in constant communication with the team and was receiving photos and updates. No matter how you slice it, it’s a very hard life change. But this disease challenges us at every stage. She eventually came to know the community as her new home. Her new normal. And we knew we could not possibly care for her in our own homes. 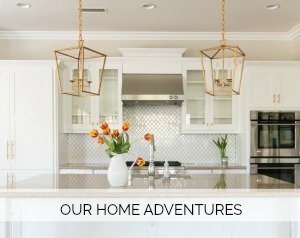 *If you want to know more about her home, how we chose it, and things to consider . . . go here. Just wondering if you saw any early signs/symptoms in your mom and how you handled that. I have written more about that here. Early on mom seemed to glaze over during conversations. She just didn’t attend to what we were saying like she had done in the past. Has your mom ever taken medicine to slow the progression? No. Early on, my mom was very upset that we thought something was wrong. Because of that, my dad shied away from getting professional advice. This disease causes immense emotional strain and that always plays a part in the course of action. Does anyone else in the family have Alzheimer’s? No. My mom is the first. And with research and great hope for a cure, we pray she is the last. How often do you visit your mom? I always see mom on Tuesdays. She also receives regular visits from my husband, sister and aunt. There are often care meetings and other reasons that we go more. She is 45 minutes away which makes it more difficult to get down to see her as often as we would like. In a perfect world, we would magically move her care community five minutes down the road. But because this is the best place for mom, we make it work. What does your mom get frustrated about? She does not like to be told no and she despises showers. I don’t blame her. Imagine being that vulnerable and having a team of people undress you and shower you all the while you don’t want to be touched. Lately she does not like to change her clothes. She can not understand simple directions such as lift your foot up so it’s very challenging. Her disease has progressed to a point where she can easily get over stimulated. It’s hard to know exactly what the triggers are but she can get extremely upset. It’s tough to witness. I’ve learned to calmly redirect and try to smile as much as possible to slowly turn the situation around. What are ways that we can support caregivers. My mom is in the same position you are. How can I support my mom? This question is so very thoughtful. We spent years trying to offer support to my dad. It remains one of our greatest heartaches of our lives. If you have a friend or a loved one who is not the actual caregiver but walking this path like we are, just show up. Make the phone call to ask how they are. I love when my friends ask how I am doing or ask how mom is. The answer is never simple and I very rarely open up, but knowing they care is huge. I’ve had friends drop dinner off on our front porch on a Tuesday when they knew it was a particularly difficult day. Do not take it personally if a friend going through this pulls away a bit. I speak from experience. This journey is emotionally and physically exhausting and it requires a lot of energy. 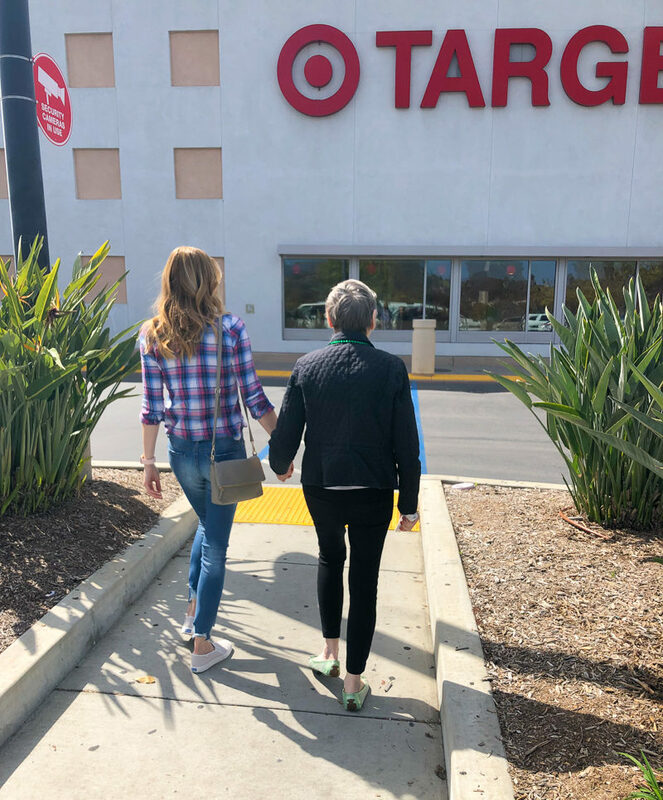 Walking this journey with my mom and being a mom myself pretty much fills my time. We have a tendency to protect our family time because I don’t want that to suffer. Prayers. We have a very strong faith and I know with every fiber of my being that prayers are answered. We face difficult decisions on a weekly basis it seems and knowing my friends and family are joining us in prayer is very powerful. What’s the most surprising thing about going through this journey? Wow. This is the question of all questions because we are so very open to all of the lessons we are learning. Mom’s suffering can not be for not. We’ve learned that there is no road map and every day brings new challenges. This disease causes you to dig deep and do some serious soul searching. We live for the moments of joy. We continue to grieve. We meet her right where she is every single time we see her. What is one thing you wish your mama understood right now? You are loved more than you can possibly imagine. Dad is with you every day and loving you with all of his might. You were without question the very best mom and best friend we could have hoped for. Please know that a beautiful sense of peace awaits you. You will one day be free from all of this but until then we will walk with you. We love you. Thank you for all of your questions. I answered as many as I could this go around. Many of the answers can be found in the posts below. You can follow along with our story on the Love and Open Arms Instagram account. I’m crying as I’m reading this. I don’t personally have a family member going through this disease, but imagine it is one of the hardest trials to endure. Thank you for being so raw and honest; its one of the reasons your blog has been a favorite of mine for years. These posts have served as a prompt to not take my loved ones’s health for granted. As I sit here staring at the cursor, I struggle to find words. I am so sad that this disease exists and that you and your family and especially your sweet mom are walking this incedibly difficult journey. Your strength and inner beauty are an absolute inspiration to so many. Hugs to all of you, you and your family are amazing. Everytime you write about your Mom it brings me to tears. This disease is just so awful and your compassion is admirable. Your Mom is so lucky to have such a lovely family to be patient and stick by her. Prayers for you all. I am sitting here crying as I read this – especially the letter to your mom! We are walking this same journey with my father in law. It’s a devastating disease! I love following along in your journey. I can relate to so many things. What I love the most is the unconditional love that you have for your mom. You can feel the closeness and love that your family has! Your words are so helpful for many even those who are not struggling with Alzheimer’s. Parents whose children have special needs could also find your words invaluable. You really should write a book. Many see challenges like yours as pathetic or frightening. You have a way of showing the joy and love. Love is easy when life is perfect. But your love for your mom is REAL love. Thank you. Thank you for being so open and honest with your journey. Your words are a such a help for others. Stay strong girl – you got this! Thanks so much for your honesty in sharing this journey. My gram is 91 and my mom is in a role similar to yours. I struggle with how to support them both. My gram gets easily agitated, paranoid and can be difficult. She was always a tough cookie, but this disease has not been kind to her. She still recognizes us, but gets confused easily and forgets what she said or did just minutes ago. It’s a strange phase, part of her is still there, but so much of her feels lost. My mom is struggling and I fear the weight of caring and stressing is taking its toll. So thank you for letting us know we’re not alone. Praying peace for you Courtney. He is with you every step of the way. I’ve walked your journey and my faith was also what got me through. Sending love and hugs. Courtney, thisbis all so touching, beautiful, bitterly painful, yet powerful. Thank you for sharing your journey. Courtney – Tears streamed down my face reading this. I truly can’t imagine the pain your heart feels watching mom go through this. She is so lucky to have you and your family to be there for her and to love her unconditionally. Your moms smile is so warm and sweet, thank you for sharing her with us. Sending you so much love from Boston. We went through the same journey with my father in law and unfortunately there’s not a one size fits all plan of action. We did find the agitation was calmed by giving him something to do with his hands such as building blocks, throwing a ball back and forth or ripping apart small boxes such as tissue, cereal, etc ( like he used to do at home for recycling purposes) . And music! He was non verbal and then one day belted out the lyrics to “You are my sunshine” which was playing in the elevator. I’m sure youre aware of agitation aprons that give their fidgety hands something to do. Thank you for sharing this incredibly difficult, emotional journey. I hope it brings comfort to know you’re not alone…..God bless your sweet mom and your family. Oh Courtney! So many things you describe in your updates remind me of my mother’s journey through Alzheimer’s. It started out with difficulty following conversations on the phone, forgetting to pay bills, little things that were not quite right. When I brought it up during an appointment with her doctor, she became very upset with me, and unfortunately the doctor bushed it off as normal (this was close to 15 years ago). My mom was physically handicapped as well and my dad neglected his health taking care of her at home. After two failed attempts at assisted living facilities, my dad was able to get in home help with her care. While this sounds like a good solution, it came with it’s own set of problems, too. My dad never had a moment’s rest, physically or mentally, but refused to place her in long term care. My mom survived about 8 years after her diagnosis, the last 3-4 years bedridden and completely non verbal. Such a brutal disease, to the person afflicted and the family. You write so beautifully about your family’s journey through this. Wishing God’s mercy for you and your mom. Thank you for this. I understand. 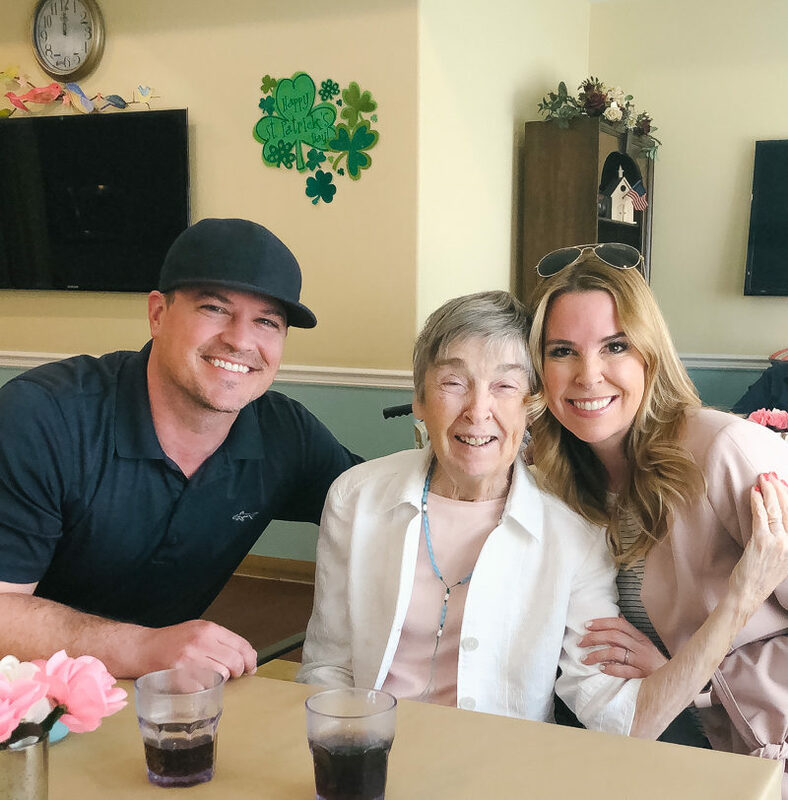 We lost my peppy, active, acts-like-a-35 yr-old mother-in -law 6 days ago, but our Alz journey with my own mother continues into it’s eighth year now. So many questions as to Why. I find comfort in : “…faith, hope, and love, but the greatest of these is love.” Our faith often wanes, our hope often wanes, but that’s ok, because what’s greater than either of those is the love for our Moms th at never wanes. Sending you prayers for strength. You are such a beautiful person, I feel such sadness that you have to go through this with your sweet mom but know without any doubt that you are blessing the lives of so many with your genuine words and loving heart. You are someone many will look to as they walk their own trials and hardships. Thank you for your courage to share and the example you set. You honestly radiate love and I truly mean that.